It seems like every product that comes out on the market today claims that it will make your life better but most products don’t live up to their own hype. They don’t do what they said they would do, wasting your money and cluttering up your supply cabinet. MonoFoil is different. Here are three examples of the very real, very important reasons why MonoFoil will make your life better that aren’t just hype. Big box stores such as Target and Wal-Mart stock a mind-numbing number of traditional cleaners and disinfectants. Have you walked down a cleaning supply aisle lately? It can be pretty overwhelming. Online, it’s even worse. A recent Amazon search for “household cleaning spray” returns over 40,000 results! (We’re one of those results! You can find our Pet Odor and Stain Remover here: https://www.amazon.com/Apply-Guard-Pet-Stain-Odor/dp/B01MRNDX1X/ref=sr_1_1?ie=UTF8&qid=1528295649&sr=8-1&keywords=monofoil) There are kitchen cleaners, bathroom cleaners, and floor cleaners. Everything has a cleaner and you have to buy a product for each, or do you? Not if you use MonoFoil. MonoFoil-D is an all-purpose that cleans and disinfectsmost surfaces (including SOFT ones!) Most antibacterials require you to spray the surface, let it sit for a set amount of time, and then wipe it off again. Who has time for that? With MonoFoil, spray once, let it air dry, and you’re done. There’s no wiping and no mopping. MonoFoil is a healthcare-grade disinfectant and within ten minutes of being sprayed onto a hard surface, completely annihilates 99.9% of the most common antibiotic-resistant bacteria that threaten your homes and families: Staphylococcus aureus, Salmonella enterica (Salmonella), and Pseudomonas aeruginosa. Not only that, but MonoFoil is also effective again viruses, fungus, and mold, and forms an invisible barrier around the surface it is applied to, continuing to protect it for 24 hours. MonoFoil can be used in all areas of the home too, eliminating the need to keep multiple bottles of different cleaning products around your home. Most mass-manufactured household cleaners are comprised of toxic chemicals poorly camouflaged by strong perfumes can trigger medical problems in people prone to respiratory issues and headaches. This creates difficulties for sensitive populations and, well, anyone who wants to keep their environment as clean as they can and as safely as possible. MonoFoil is different. It’s patented technology uses an entirely different mechanism to fight odors and microbes and gets rid of them the first time so that you aren’t stuck having to reapply over and over again. This prevents excess waste in the way of empty spray bottles and nozzles. Your sponges and scrubbies (should you choose to use them) last longer because you won’t have to use them as often. This cuts down on the number of products that wind up in landfills and keeps money in your pocket too! 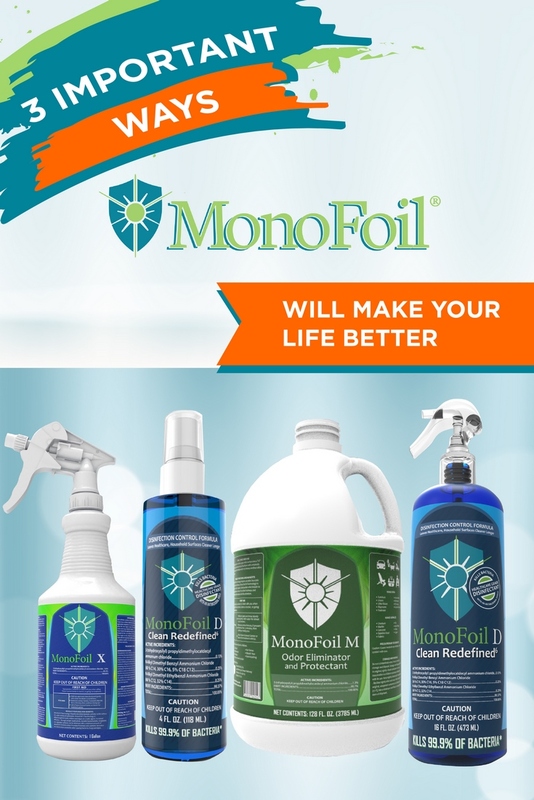 MonoFoil is hypoallergenic, free of bleach, phosphates, hydrogen peroxide, sodium nitrate, contains no harsh acids, and most importantly, is safe to use around your home. These same qualities make it easy on the environment too, so you can protect your family and do it without causing undue harm to our to our shared home, planet Earth. Need more reasons to give MonoFoil a try? Check out our products page to see what will work best for your needs. What have you got to lose other than those ten extra bottles under your sink? Share this page and your MonoFoil story on Social Media.